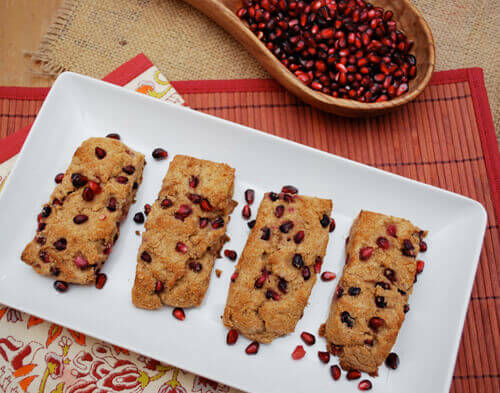 Mix up your morning routine and some ruby red whole wheat pomegranate scones to your breakfast meal. To my readers in the United States, Happy Thanksgiving! Today is a day of reflection for most. A time to appreciate all that we have, to help those in need and to remember how our country first began. Every day, I recognize how truly blessed I am for my husband and children, and the laughter, joy and love they bring to my life. I didn’t realize how empty my life was, until they all entered in. I am also thankful for the wonderful foodie friends I have met through blogging. One of them is Stephanie from Life Tastes Like Food. She is hosting The Holiday Project on her blog, and invited me and other bloggers, and non-bloggers alike, to share stories about the holidays or food or both. 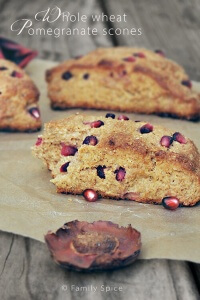 Today, she is featuring me and my recipe for Whole Wheat Pomegranate Scones. 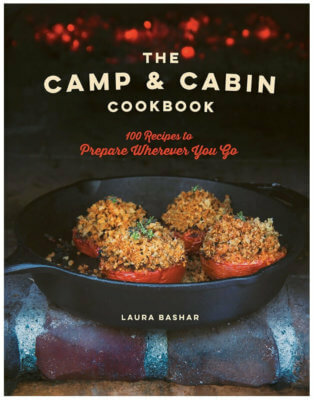 Check out her blog, her gorgeous pictures and her delicious recipes. Her Crab and Cream Cheese Stuffed Jalapeno Poppers are my personal favorite and taste super amazing! Stop by her blog, check out my post and say hi, won’t ya? The Princess: “Thanksgiving means being with your family.” When I asked her what she was thankful for, she flashed that smile that makes me melt and jumped in my arms and gave me her bestest hug. Continue squeezing butter into flour mixture until it resembles coarse crumbs. Pour yogurt mixture into flour mixture and mix with a spoon or a fork until a rough dough is formed. Do not over mix the dough. Turn one-third of the dough onto a lightly floured work surface and shape into a circle or rectangle, about 1/3-inch thick. Press over the pomegranate with another one-third of the dough from the mixing bowl. 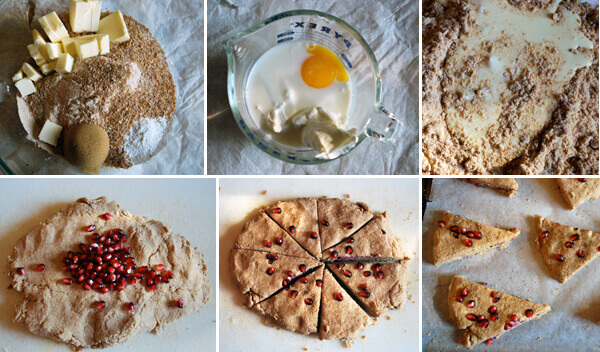 Gently press the remainder of the dough over the pomegranate. Cut dough into 8-10 even pieces. Place scones onto the prepared baking sheet and bake until golden, about 12-15 minutes. Wonderful recipe! The photos are beautiful as well. Awww! Your princess is so adorable! It's funny how each one answered to your questions. 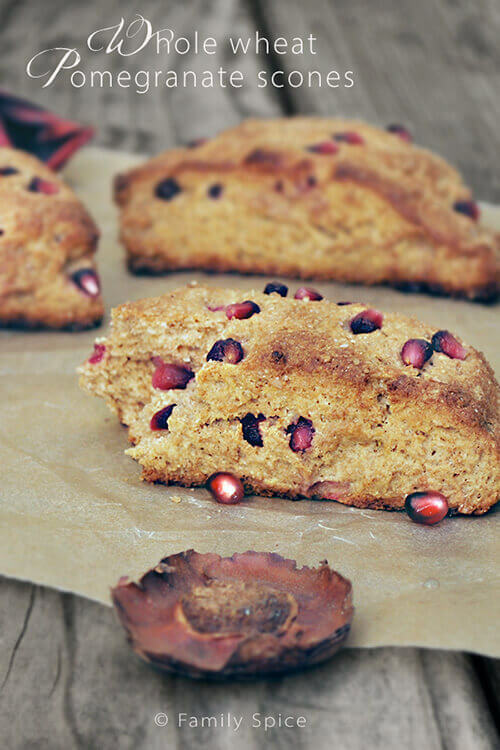 =) I love scones and wow this one with pomegranate!? So unique and I'd love to have some… I'm checking out the guest post now. Your photographs make me want to eat everything in the shot… not just the edible stuff. You are amazing, and so are these scones!!! Trying them out this weekend! 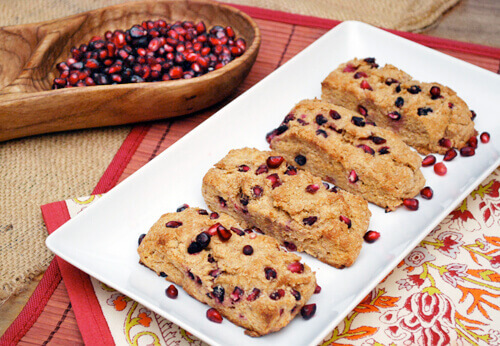 I love the idea of using pomegranate seeds in baked goods! Especially scones, they are so beautiful with the little red jewels in them! I love scones, they look amazing. Would love for you to share this with us over at foodepix.com.